I was disappointed to learn today, that New York’s highest court ruled against the NYC Board of Health’s limits on sugary drink sizes. The state’s highest court on Thursday refused to reinstate New York City’s controversial limits on sales of jumbo sugary drinks, exhausting the city’s final appeal and handing a major victory to the American soft-drink industry, which bitterly opposed the plan. In a 20-page opinion, Judge Eugene F. Pigott Jr. of the New York State Court of Appeals wrote that the city’s Board of Health “exceeded the scope of its regulatory authority” in enacting the proposal, which was championed by former Mayor Michael R. Bloomberg. In the ruling, the court suggested that the NYC City Council was the proper body to enact a sugary drink portion cap of 16 ounces, instead of the Board of Health. There is little support on the City Council for such legislation, at this time. It’s unfortunate that New York’s highest court did not support the city on this important health measure. While industry and the press loved to refer to this initiative as a “soda ban,” it was nothing of the sort. The city merely was trying to re-set horribly out-of-whack norms, deliberately set by Big Soda to increase their profits. For decades, sugary drink sizes have been growing — starting out in the 1950’s, McDonald’s large soda was 7 ounces, whereas today, McDonald’s large soda is a whopping 32 ounces. Industry claims that they upped the sizing due to consumer demand. But in reality, increasing cup sizes, and of course prices, is an easy way for fast-food and other restaurants, as well as sugary drink manufacturers to bring in more income. The reason so many New Yorkers were opposed to the sugary drink portion cap is that they seemed to believe that their choices were being taken away. In reality, the soda/fast food/restaurant industries have been making all the soft drink serving size choices for consumers for decades. For example, you can’t purchase one serving of soda (8 ounces) anywhere. 16 ounces is the smallest size available at many restaurants and venues like stadiums, arenas, delis and fast food outlets. 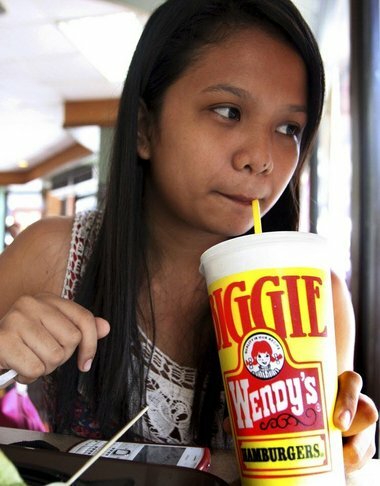 When you order a small-sized drink, you’re almost always pressured to purchase the larger size “for just a quarter more.” By manipulating consumers into up-sizing their beverages, both restaurants and the soda industry make buckets of additional profit, at the expense of the consumer’s health. Due to today’s unfortunate ruling, more people in New York City will die from obesity-related impacts, and the number of annual obesity related deaths will soon surpass deaths caused by smoking.